What makes a successful board game layout? Well, there’s no “one size fits all” board design, that’s for sure, as the multitude of styles will attest to, but there do seem to be a few key elements that shape the majority of iconic table-top board games. Let’s check ’em out together, weighing the pros and cons, while I also fill you in on where we are with our layout, including the challenges we’re currently dealing with and how we plan to move forward. The tried-and-true square layout, with a rotation clockwise along the various real estate spaces is a design with many iterations recurring over time. There’s something pleasant and simple about ending up where you started which allows for continual play over the same spaces, thus saving design space and leaving the central area uncluttered, thereby freeing it up for decks and, of course, a bold, catchy title. This layout wouldn’t be appropriate for a game like Reel Me In!, considering it is incongruous with the premise of floating down, not up a river. But, for the idea of real estate, and charging others rent when landing on your space, it works magnificently. As far as production and distribution goes, this a bi-fold game, fitting into the classic, rectangular box we’re all so familiar with from our youth. The trend has moved away from this style, most likely due to the cost of shipping, where now we see more tri-fold games, whose compactness lends itself to cheaper shipping. I originally envisioned Reel Me In! to be rectangular, in part due to the parallel between the aspect ratio of landscape paintings and the recognition of rivers as wide and flowing across land rather than circularly. But, we have since agreed upon a more or less square layout, keeping the flow crosswise to evoke the same idea. *What are your thoughts on this decision? Do you prefer square, rectangular, or other less orthodox designs when choosing a game? Do you not have a preference, so long as the game’s fun? This is a common START to FINISH layout, common to many children’s games. Though simple and linear, the layout is easily comprehended by all ages and movement is, like Monopoly, governed by the luck of a die roll, though some decisions, and thus strategy, may arise from action cards. Most peoples’ main qualm with games like this is the reliance on luck. There are scant opportunities to exercise your free will or strategize that much. Nonetheless, it has withstood the test of time. Reel Me In! 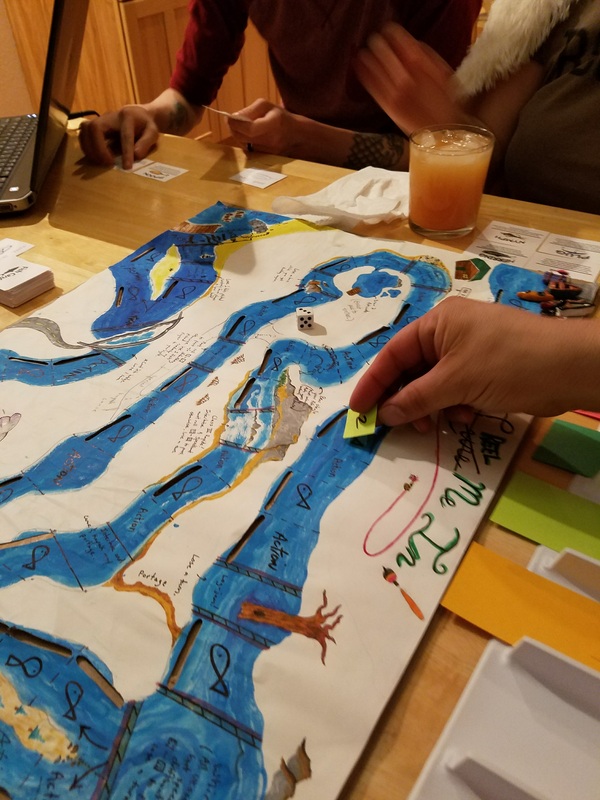 also utilizes the START to FINISH element, or rather, the PUT-IN to PULL-OUT, for obvious reasons, though we have included extra pathways and possibilities to make the game more engaging for older audiences as well, such as: a portage route; an optional pickup and boat launch path downriver; action cards and spaces that move a player to the beginning or forward and backward along the river; a split-route flowing around a river-island; and varied strengths and weaknesses for each watercraft (I’ll discuss more on this below). Okay, everyone knows this one. Shoot, we live this one everyday. The Game of Life, or simply, Life, has been around in different forms for over a hundred years, though the modern version that we’re accustomed to didn’t come out until the 60s. This is also a bi-fold game, though more square than Candyland. The twists and turns mimic life’s helter-skelter movement. To offset the crowded maze of possibilities, the gameplay route is kept streamlined and its style pops out from the more painterly background for a balance of chaos and order. We’ve been inspired the most by this game while designing Reel Me In! We needed the river to look like a river, without the spaces being too variable in size, while still maintaining some semblance of realism. The compromise, as it stands, has been to have most of the spaces be uniform, but to allow every “obstacle space” to have some freedom, such as the whirlpool or waterfall spaces. Also, the corner pieces, similar to Life, are given a bit of leeway if needed. Not every space is the same in Life (nor will they be in Reel Me In! ), but a cursory glance at Life presents a striking continuity to the path, at least as far as width is concerned. Furthermore, Life contains an array of somewhat impressionistic background art, which is something we also wanted to highlight in our game, given the importance of nature to the fishing experience. Thus, as an homage to the majesty of the “great outdoors,” we hope to include a conglomeration of landscapes, animals and structures to heighten the sense of “place” in the game. As you can see below, there are many possible game path layouts, and these exhibit just three potential candidates. I personally prefer a combination of all of them, which, of course, only makes our graphic designer’s job harder. Sorry, Gil. Although Reel Me In! shares little with conquest strategy games, it is our intention to afford each player the opportunity to decide their own fate, while still being bound somewhat by luck and chance. We’ve devised a handful of ways of doing this which I’ll discuss momentarily. But, first, let’s look at Risk. This war game begins with each player choosing an army color (or by dealing them out randomly). After dealing out territory cards, and placing, in turn, one army on each territory, leftover armies are then placed in turn on the territories one wishes to fortify further, given the placement of other players’ armies. And from here battles are waged via die-roll and conquest ensues until one ultimate Napoleonic survivor remains triumphant. Sounds epic, right? What is of interest here is the fact that each army’s continent (and each territory for that matter) has strengths and weaknesses which may be exploited by the more strategic-minded players. Do you hunker down in Australia, with only one way in and one way out? Or, do you attempt to conquer all of Asia and spread yourself thin, but gain extra army allotments each turn for your held territories? Oh, the possibilities! 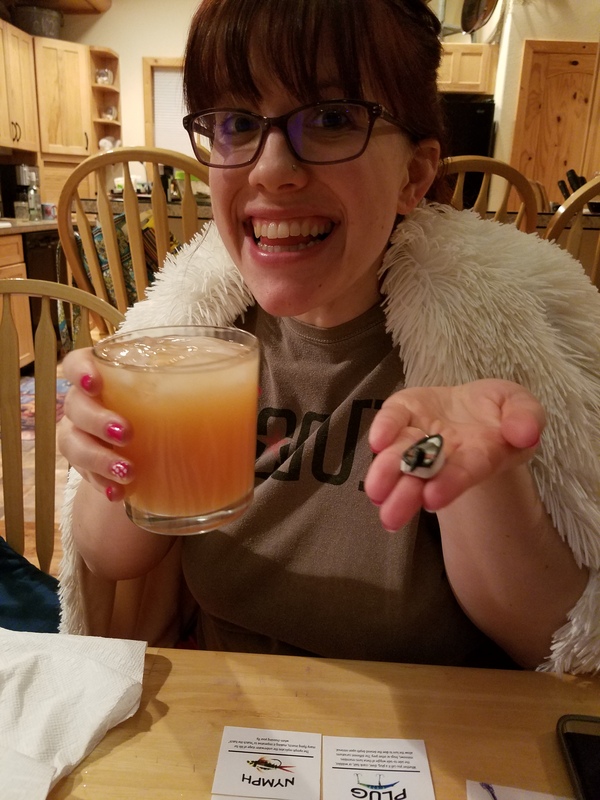 We have adapted the weighted-player idea to Reel Me In! by giving each watercraft (drift-boat, canoe, kayak, raft, innertube, motor-boat) certain advantages and disadvantages along the board. For example, the “Whirlpool” space only affects those boats without engines. Or, the “Class III Rapids” space is fine for the motor-boat, kayak and raft, but all others must roll a 4 or higher to pass safely. Similar criteria apply to the “Portage,” “Shallows” and “Forgot Drain-Plug” spaces. This is just one way that we’re weighting the gameplay, so that every time you play it’s unique. The final game I’d like to mention, Settlers of Catan, is more of a nation-building strategy game, but it should be mentioned due to its unusual board format. Here, the board is constructed of hexagonal pieces fitted together like a honeycomb, which are distributed differently every time you play. This novel concept allows for numerous configurations and keeps gamers interested over time. To provide a similar level of differentiation for Reel Me In!, we created the “Fishing Hole,” a slotted card holding area alongside the board, which contains uncaught fish, allowing for players who land on an uncaught fish-space another attempt to catch the fish that eluded their predecessors. This area contains four slots. If the fishing hole fills up, and a fish goes uncaught, the oldest fish is bumped. 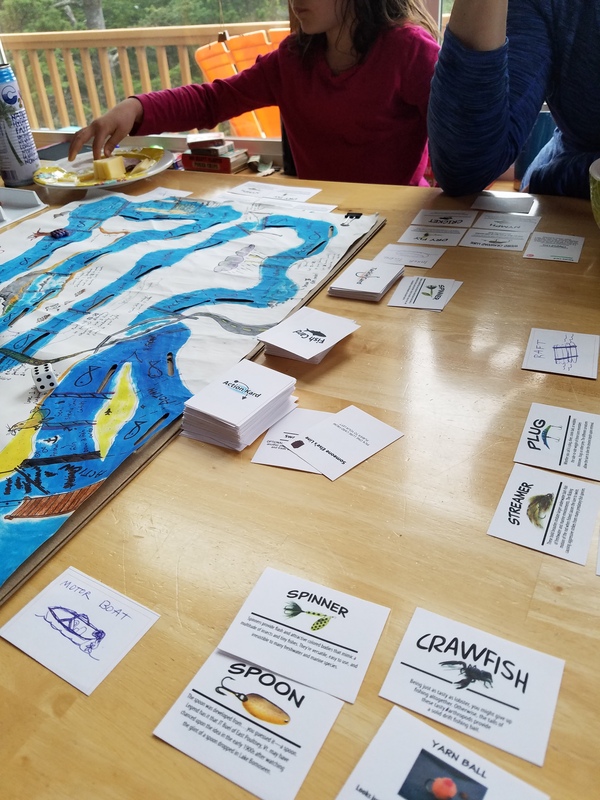 Other rules apply, but the general premise (as is the case for the entire game) is to simulate, as closely as possible, the actual fishing experience. 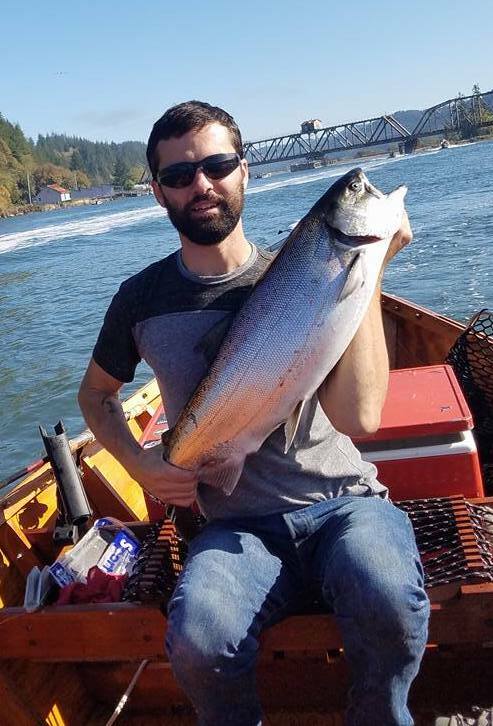 If you don’t catch that +6 Chinook salmon, it shouldn’t just be buried in the discard pile, but instead placed in a waiting area, where a fisherman/player with the proper tackle is given a chance to catch it. I mean, it’s still right there behind that rock, right? *What do you think? Do you like the idea? Our artist and graphic designer have been hard at work this year on tweaking and refining the three decks. As you can see below, the transition and hybridization of art and design for each card is a marriage of idea, aesthetics and function. This is so that the quantities and effects of each card can be tailored perfectly before we move on to finalizing the board. The original board, which I hand-drew (be gentle) has since been rearranged, doctored and marked up significantly. And yet, it serves its function for now. The final board will no doubt be vastly improved, but we have been able to play-test using this temporary board and the majority of it will be carried over into the next installment. Whether you like “divide-and-conquer,” “settlement building,” or plain old “roll-the-die” games, we hope we’re developing something with all the right components to keep the multifaceted interests of today’s gamers in mind. *If you have any ideas or critiques of our design so far, please don’t hesitate to share them, as it is YOU that we’re designing this game for as much as US. We want it to be something families, friends and people of all ages and backgrounds will enjoy for years to come.